Last week we got the chance to head down to the newly opened Beanstro at Ngee Ann City for a media food tasting session, and it was definitely a yummy experience! 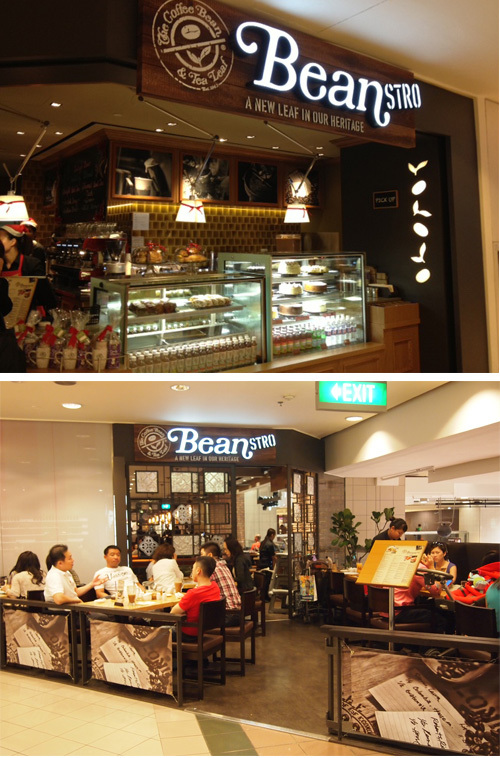 Beanstro is a halal-certified casual dining restaurant by the people at The Coffee Bean & Tea Leaf. If you've been to MBS, you would've probably seen their outlet, and now, they have just opened their second outlet right smack in the middle of town! So convenient for us to drop by and especially good for chilling out at after a whole day of shopping. If you are wondering where exactly in Ngee Ann City is it located, it's actually near Mango and Havaianas. It's really quite hard to miss them out especially when you pass by their delectable selection of cakes to choose from that is proudly displayed at their entrance. I must confess that I'm the drooling greedy pig that walks pass it and will stop to drool all over them in my head. We popped by during lunch time, and I was actually expecting there to be not much people since it is a weekday afternoon, and those working around the area wouldn't really have the time to chill at a cafe, but to our surprise it was almost packed. In fact, there were hardly any empty tables during the time (almost two hours!) that we were there. Now, for more serious talk! The FOOD! You can expect a wide selection of American cuisine and your favourite Coffee Bean and Tea Leaf beverages. They even have an all-day breakfast menu ranging from healthy options like Muesli ($8.00) and Oatmeal ($7.50) to classics like the Eggs Benedict ($17.00) and Buttermilk Waffles ($12.00). If these all sound like to much for you, don't worry, they have light items on the menu like salads and sandwiches, as well as sides like calamari and mashed potatoes. 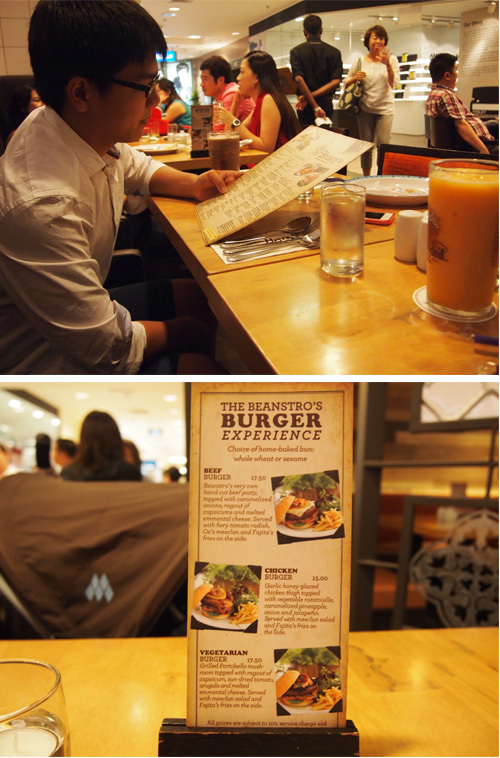 Also, from now till the end of April they've got a Beanstro Burger Experience. To kickstart our meal,we ordered the Seafood Velvet soup and Battered Mushrooms. Both dishes were done really well. Soup was really lovely, and I would have gladly ordered another portion if we didn't already order so much food. The battered mushrooms were huge, and it wasn't because of a thick batter. They were really juicy and together with the aioli, a perfect combo. ($7.60). Daddy Li commented that his drink was really "The Ultimate", if you get what I mean. He doesn't usually sing praises when we dine, so if he does, you know it probably is worth a try. For our mains, we ordered the Breakfast Steak and Eggs ($19.00) and Seafood wrapped in Cartoccio ($26.00). When we first started on the steak, we found that it was a little tough and required quite a fair bit of chewy. However, when we got to a different part of the steak, the meat was much more succulent, and easier to chew. Probably needs to be cooked a little more evenly in our opinion. Daddy Li liked the bread, and I just enjoyed the combination of steak, egg and bread eaten all together. Especially popping the yolk and later in just spread all over the steak. Yum yum! 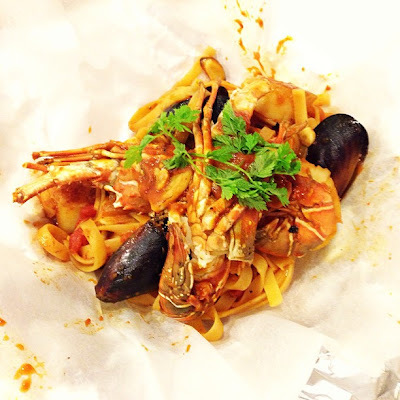 The pasta was chockful of seafood goodness like lobster, mussels and scallops. Only gripe for us was that it was a little too spicy for us. Other than that, it was a lovely dish. 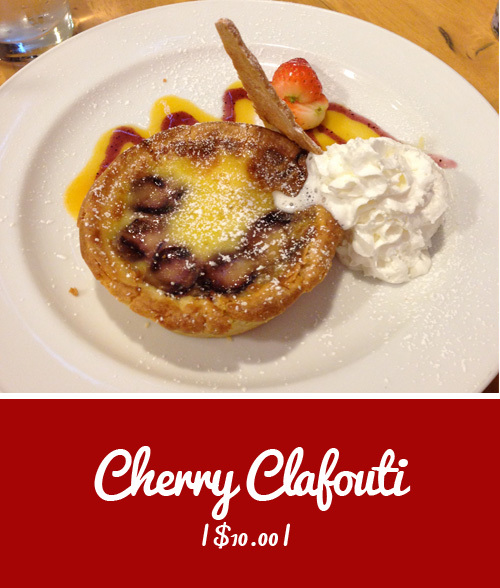 To end off our meal, we actually ordered the Creme Brulee, but the Cherry Clafouti came instead. It was our first time trying it, and was surprisingly good so we were kind of glad that the order got mixed up. The service was great. Staff were very friendly and always checking to see if everything was going well. They also knew the menu items very well, and made good recommendations. I really dislike going to eateries where they don't even know what's their special dish or what goes into it/where their fish/meat is from when you ask. Despite the crowd, service was still prompt and fast. The only problems we faced was that we had ordered Daddy Li's drink with whipped cream, but it came without and that they dessert order was mixed up. It was fine with us since they tasted yummy anyway, but probably something that they should take note of. I like the very chill ambience and we had a very comfortable and enjoyable time. Food portions were big and tasted above average, and staff were more than willing to go the extra mile. Definitely recommend it as a family go-to place if you want to have a nice meal that's child friendly and easy on the wallet. 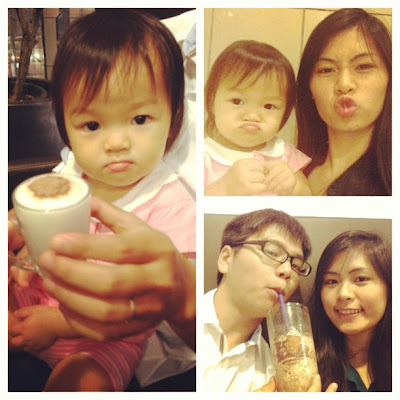 Disclaimer: We were invited to the Beanstro Media Food Tasting session. All comments are based on my own opinion/views and was not influenced by any external factors. The pasta! Wow! Someone pass me a bib!! !